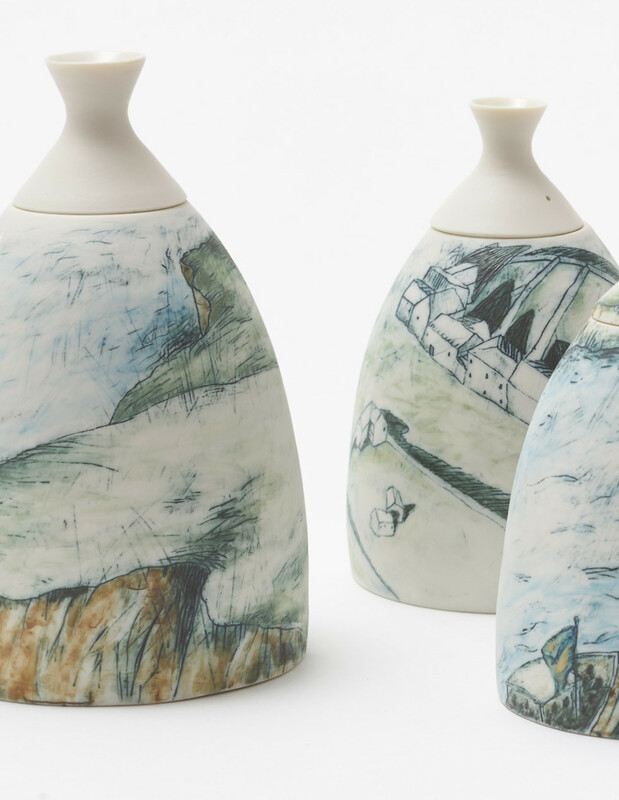 In 2010, I developed a series of lidded vessels, a narrative depicting a boat disaster that occurred on the coast of Christmas Island in 2010. The island is a territory of Australia, situated in the Indian Ocean. A boat, full of refugees, sank before reaching its cliffs. This resulted in the destruction of the vessel and death of forty eight people aboard. In 2012, the topic of refugees remained a political issue that Australian politicians attempted to resolve or ignore. During the 1990s, the Labor Federal Government under Prime Minister Paul Keating introduced mandatory detention for unauthorised boat arrivals. Following this, in 1996 the Liberal Party, under Prime Minister John Howard, introduced off shore processing arrangements for illegal boat arrivals. Retaining a familiarity with the political narrative of refugees within Australia rendered the form I created in response to the issues in a similar fashion. Three vessels stand beside each other, varying in height with flat, wide bases (Figure 28-30 [p 78 & 79]). The contours of the walls narrow as they reach the lid, which sits atop the rim of the form. The lid repeats the shape, narrowing its ascent to the tip where it opens slightly to a miniature concave. Creating lidded vessels that can contain liquid corresponds to the images that surround the shape. Water, imagined on the inside, is drawn on the exterior, depicting the swells of the ocean. The shape of a small boat rocks in the currents. At the narrow angle of the form, as the neck closes in to hold the lid, land is illustrated, mirroring the reality of Australia’s controlled intake of refugees. 1] Mandatory detention has been a policy of both Labor and Liberal Governments within Australia since 1992. Manus Island in Papua New Guinea and the Pacific Island nation of Nauru became off shore detention centres in 2001 under Liberal Prime Minister John Howard’s ‘Pacific Island Solution’. In 2008, Labor Prime Minister, Kevin Rudd, and in 2012, Labor Prime Minister Julia Gillard adjusted Australia’s systems of mandatory detention with the aim, however unsuccessful, in creating a more humane system. The Federal Liberal Party, in 2014, began the policy: ‘Sovereign Borders’, operated by the Australian Defence Force. The current Federal Liberal Government holds zero tolerance to any illegal boat arrivals and information to the public is restricted, resulting in news black outs (Phillips, 2011, p. 2).